and the People of God among a people of an alien tongue. Derbal Yiragan was driven back. and the foothills like young sheep. O Yiragan, that you were driven back? O little hills like young sheep? at the presence of the God of gods. and threw sand into the waterhole to make it safe. 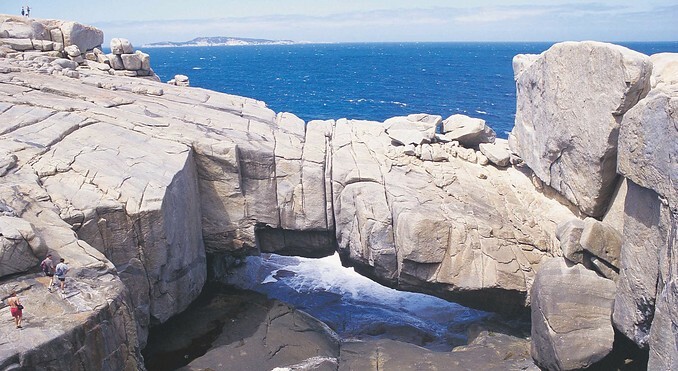 Torndirrup – the National Park on the south coast at Albany with the Gap and Natural Bridge. Walyunga – National Park on the Darling Range near Perth with many sacred places associated with the Waagyl. Throwing sand – When Noongars arrive at a water-hole or river, they throw sand into the water so as not to disturb the Waagyl and make the water safe for drinking and swimming. Graham Tomlin, Looking Through the Cross: The Archbishop of Canterbury’s Lent Book 2014, Bloomsbury Academic (2014), Paperback, 240 pages. Being a Christian requires personal engagement – with God, with Jesus Christ, with neighbour and stranger, with truth, with good and evil. For most of us, being a Christian can be complex and demanding, but we remain committed because we believe that God is eternally committed to us. A good Lent book refreshes this sense of personal engagement with Christian living. It should encourage, inspire and inform by taking readers both back to when they fell in love with the faith and forward by challenging readers to grow spiritually. Good Lent books are often about the Cross and Resurrection clueing us into the liturgical movement of Lent and the Paschal mystery at its climax. Graham Tomlin’s Looking through the Cross is a very good Lent book. It is about the Cross. Tomlin tells us that his early chapters are looking at the cross, trying to understand more deeply its meaning for us, and the later chapters are looking through the cross, using the cross as a lens on the world. In the chapter headings, ‘The Cross and Wisdom’, ‘The Cross and Evil’, ‘The Cross and Power’, ‘The Cross and Identity’, ‘The Cross and Suffering’, ‘The Cross and Ambition’, ‘The Cross and Failure’, ‘The Cross and Reconciliation’, and ‘The Cross and Life’, it is not entirely clear when we change from looking at to looking through. I am sure that ambiguity is deliberate: the cross always both teaches us about itself and reveals how it has changed God’s world. Archbishop Rowan Williams commissioned The Reverend Dr Graham Tomlin to write this year’s Lent book. His successor in Canterbury, Justin Welby, ‘could not be more pleased’ with the choice. Centred in scripture, scholarship and pastoral experience, this book seems to me to bridge some of the divides in contemporary Anglican thinking. The cross demands that we clearly separate Christian faith from the surrounding culture. In the powerful chapter on identity, Tomlin describes how our experience of family christenings obscures the radical change God makes in us in baptism when God gives us a new identity. Using the image of a protected witness or juvenile criminal with a new identity, he reminds us how hard it is to live out of a new identity, and how the old identity will continue to exert a pull on our lives. But the cross is ultimately the path to life. We are made not to end in death, but in life. Tomlin reminds us of the leap in imagination we need in order to lay hold of this reality, but also rallies us with the knowledge that the new life of the cross and resurrection is ultimately God’s work and not only ours. It is helpful if a Lent book has some guidance for its use: questions to provoke reflection or small group discussion, suggestions for art response, even a reading program. Looking through the Cross has none. This is a significant drawback in a book promoted for Lenten reading. Even without this, individual laity, clergy and groups will find Dr Tomlin’s book refreshing, challenging and clear. At the end of Lent, the book will help readers emerge at Eastertide re-engaged with their Christian faith. I have been scraping the rust off my Latin this morning, translating parts of APBA Morning Prayer. My efforts are in bold. If you can suggest any improvements or corrections, I would be grateful. The night has passed and the day lies open before us. Nox fugata est diesque patet pro nobis. Verbum Tuum vivet in nobis. Ferat multum fructum ad gloriam Tuam. Dear God won’t you take pity on me? REVIEW: Robert Béla Wilhelm, Perfect Joy in Holy Week: Walking with St Francis of Assisi in the Footsteps of Our Lord, Storyfest Productions 2013 (Volume 3 of the Collected Works of Robert Béla Wilhelm). Dr Robert Béla Wilhelm was our keynote presenter in the Third Order Conference in Perth in 2006. People warmed to Bob and his gentle style of telling stories about St Francis. Quite a few Tertiaries have kept in touch with Bob since then. Bob’s style of story-telling moves me, sometimes to tears. I sometimes find them hard to read to others without tearing up. His story-telling evokes an emotional depth to help the listener connect with the richness of his stories. Perfect Joy in Holy Week is a series of six stories about St Francis for the six days of Holy Week. Each story has a short version and a long version, and each story is introduced by the Scripture readings set for the Eucharist of the day and concluded with provocative reflections. These stories are accessible to anyone and speak strongly into anyone’s life. The stories can be used in worship, particularly at an appropriate Eucharist, at an Area/Region meeting or in your private devotions. You can read or tell the story yourself, or, in the iBook version, hear Dr Wilhelm himself bringing these stories to life. Bob is also an icon writer. Perfect Joy includes traditional icons and paintings as well as some of Bob’s own. So prayerfully are they written I find I have to look carefully to see which are the traditional icons and which are Bob’s. The attention to detail in this book is obvious. He includes not only the lections for his home Roman Catholic tradition, but also the Anglican and ecumenical lections where they differ. Design values are high even in the E-book versions. The pages were lightly textured and the layout easy to use, colourful and easy on the eye. While they follow the great events of Holy Week, the stories and reflections can still be enjoyed at any time of the year. Rae and I didn’t get around (typically) to using these stories until Easter week, but we still found them to be fresh, inspiring and encouraging. The easiest way to obtain either a print or electronic book is by visiting the Storyfest bookstore at http://www.sacredstorytelling.org. Review first published in the Pentecost 2013 Newsletter of the Third Order, Society of Saint Francis, Australian Provinnce.